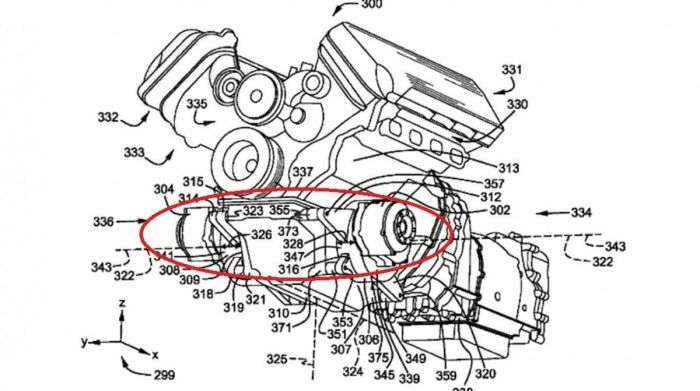 This information on a hybrid V8 drivetrain from Ford was first filed with the U.S. Patent and Trademark Office almost two years ago, but it was only recently published to the government firm’s website. In that filing, we learn that this is not a traditional hybrid system with an electric motor assisting the transmission at low-torque points but instead, this system adds a pair of electric motors to the engine block which drive the front wheels. In other words, this is an all-wheel-drive hybrid system, with the combustion engine powering the rear wheels while a pair of electric motors power the front wheels. As a result, not only could this patent lead to the first hybrid Mustang, but it could lead to the first all-wheel-drive Mustang, which offers hybrid assist and V8 power. The patent filing was discovered by the folks at AutoGuide and in it, Ford details a unique hybrid drive system that could be destined for the Mustang and the F-150 in the not-so-distant future. In the filing, the artwork uses what is clearly a V8 engine, but the fine print explains that it can be any engine, so long as it is mounted longitudinally. This means that the system requires a layout similar to the one featured in the Mustang and F-150, both of which are slated to receive hybrid power in the near future. In the image above, we have circled the key components of this hybrid system in red, and that is the pair of electric motors that are mounted to each side of the engine block. Each of these motors is connected to a “first gear reduction box” and an axle that runs to each of the front wheels, so each of the front wheels will have its own powerplant. Of course, in addition to the twin electric motors driving the front wheels, there is a traditional transmission that sends power to the rear wheels and while it could be applied to a longitudinally mounted 4-cylinder or V6, the idea of this system being applied to a V8 certainly has the most potential for an exciting hybrid. In most hybrids, there is a small electric engine that provides power to the transmission on start-up and at other points where engine output is the lower. Basically, when the engine is outside of its peak powerband, the electric assist kicks in to provide power to the rear wheels and lessen fuel consumption. With this new Ford system, the electric assist would likely engage at the same times, but rather than sending more power through the transmission to the rear wheels, the twin electric motors will provide that power to the front wheels. This should have the same overall impact, with the gasoline engine using less fuel at low torque points thanks to the electric assist, but there are a few advantages to this design. First and foremost, this design introduces all-wheel-drive, so in addition to making the system more efficient, this is a hybrid drivetrain that will appeal to those drivers who face snowy winters. In other words, this system could be applied to the Mustang to create a pony car that is capable in the snow while being far more fuel friendly on warm summer days. Second, in the Mustang, the addition of all-wheel-drive could improve performance. The electric motors will likely make the car a bit heavier than a non-hybrid model, but the introduction of the all-wheel-drive could afford the Mustang greater grip and improved acceleration on a hard launch. Finally, with the electric motors being mounted directly to the front axles, this system should be more efficient than a system where the electric power is sent through the transmission and the rear axle. That should allow the vehicles to make better use of the electric power compared to a tradition hybrid system, so when running on gas, electric or both, it should yield better numbers than a traditional hybrid that sends power through the transmission. Of course, we should note that there is a chance that this hybrid drive system will never be used in the Mustang or F-150, but with the promise of an electrified Mustang along with a hybrid half-ton Ford truck – it seems likely that this system could be featured in one or both of those popular models. We will probably see it used in some crossovers and SUVs, but it does provide hope that it would be used to improve both performance and economy of the Mustang and F150.